To be able to start learning the syntax and the pronunciation of a foreign language it is essential know a minimum amount of vocabulary. What's more, the more words we know the easier it will be to understand that language. Teachmaster is a complete application designed to make it easier to learn new words in any language that you are studying. To do so, it provides a simple theme-based vocabulary generator with which practicing and studying will be a pleasant task. 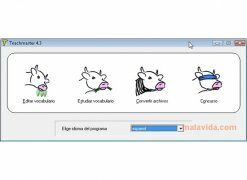 - Vocabulary editor, that will allow you to create your own lessons by gathering words (that you will have to type in) according to themes and with the added possibility to add the pronunciation by recording your voice. - Study vocabulary, that allows you to complete tests with the lessons that we have created previously. 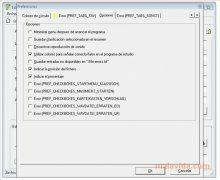 - Convert files, that allows the user to make the vocabularies created with other applications developed by the same author compatible. - Quiz, that will allow you to complete quizzes with which you can analyze your progress. - Quick or normal revision. - Study diary with monthly statistics. - Load the vocabulary files very quickly. - Access to summaries of the lessons and the vocabulary, as well as to the information of the files we have created. - Possibility to export the vocabulary as HTML and CSV or to print it, to make it easier to check. The application doesn't include any vocabulary files.